The upper arrow points at the end of a filament that starts at the spherule, appears to go under the soil grains and reappears near the upper arrow. The lower arrow points at a filament that bends. For size context, each of the pebbly grains below the larger round spherule and other rocks is about 100 to 200 microns in diameter, about the size of a sugar grain. So the two long, unidentified filaments laying on the little soil grains are about 1 to 2 microns in diameter. 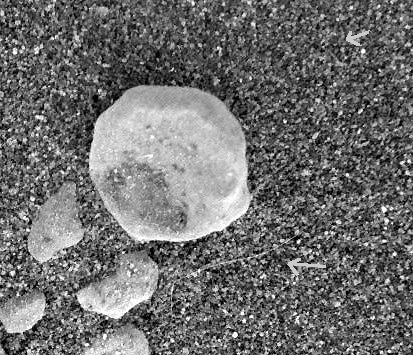 Source of image: Opportunity Microscopic Imager Non-linearizedFull frame EDR acquired on Sol 19 (February 12, 2004) of Opportunity's mission to Meridiani Planum at approximately at approximately 11:25:52 Mars local solar time, Microscopic Imager dust cover commanded to be OPEN. Image credit: NASA/JPL/Cornell/USGS. February 14, 2004 Tempe, Arizona - The NASA/JPL rover called Opportunity has been rolling along the light-colored bedrock in the Meridiani Planum taking spectrometer measurements of the rocks and stopping here and there to examine closely the soil through its microscopic imager (MI).